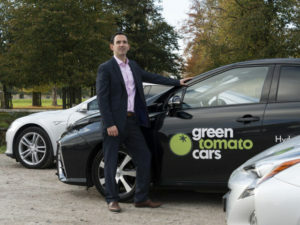 Eco-focused private hire company Green Tomato Cars has committed to defleeting all diesels and upgrading its vehicles to exclusively zero emissions and hybrid models by the end of 2018 ahead of the roll-out of the Ultra Low Emission Zone. The move was announced by co-founder Jonny Goldstone, who has returned to the helm as managing director of the business and revealed plans on “leading the way with advances in environmentally-friendly vehicle technology and making sure we treat all our customers, drivers and staff, as well as we can”. The business is currently comprised of two-third Toyota Prius – all less than four years old – with the remainder of the fleet made up of diesel executive cars and people carriers along with some zero-emission cars including the Toyota Mirai, Hyundai Ioniq and Tesla S.
Now Goldstone has said that he expects hydrogen fuel cell (HFC) models and pure electric vehicles to make up a growing proportion of the fleet, starting in the first half of 2018 – with plans to defleet all its diesel cars over the course of 2018 and replacing them with zero emission or hybrid equivalents. Goldstone is also looking to further enhance services for passengers, providing a challenge to Uber, which is currently appealing after TfL refused to renew its licence in September. Initial changes under Goldstone’s appointment include an upgraded website with easy, secure booking from the home page and a simplified process for drivers and business clients to apply to work with Green Tomato Cars.